As someone who runs a roving syndicate, my perfect day’s gameshooting has many aspects, but the overriding aim is to create an enjoyable trip. Syndicate leaders take on the organisational burden for no financial gain and almost inevitably pick up additional cost and hassle. We also take on partial responsibility for the day – after all, we have taken the cheques from fellow Guns, invariably after a certain amount of arm-twisting! When an aspect of the day goes wrong, our fellow guns will turn to us first – be it the quality of the sport, the weather or even the lunch. That said, a bit of this thankless task we must enjoy or we wouldn’t do it. And there is no better feeling than helping to create a wonderful sporting day out for friends and fellow guns, and also injecting cash and appreciation into estates that do so much good in terms of rural employment and upholding tradition. For most guns the perfect day is simple: they arrive, shoot, hopefully enjoy the day, and leave at 4pm. But the organiser’s perfect day is very different and the actual event is the culmination of months of planning. My perfect day starts a long time before 9am on the shoot day. The easiest way for an estate to guarantee the same team returns next year is to give them a superb all-round day this year. As organiser I always appreciate (and expect) corresponding dates to be offered next season. It’s a lot easier to get teams together on repeat days, as diaries are automatically free from clashes. It’s also always nice to have some time between the days being confirmed and the invoice landing on the doormat requesting payment in 14 days. In the old days I was more prepared to take a day on, pay the deposit and claw it back as syndicate guns confirmed attendance. Not now, the risks are too high. 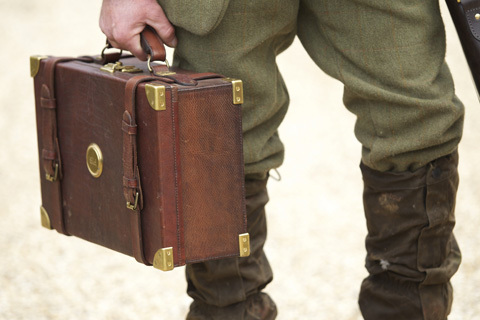 The cost of gameshooting has spiralled (as have the associated costs) and demand has weakened. Thus getting deposits from guns has become a tiring task. I find the estates I attend regularly are now more flexible and realistic towards payment, probably helped by our loyalty. This less aggressive approach allows the syndicate leader some much needed time to extract a deposit from others guns. With one of our regular estates we put down a smaller deposit (20 per cent of the total) but full payment is due by the end of June. So they have some commitment and I have time to round up the cash. At another regular estate we pay a 50 per cent deposit by May 1 and the balance a week before the day. Getting syndicate guns to pay has never been harder. The excuses list is as long as ever. Increasingly, I am minded to make guns pay 100 per cent in one hit to avoid the time-consuming emailing and subsequent chasing up. If you want a good day of gameshooting it pays to turn up on time and in relatively good order. A late start can lead to stress and gets everything off on the wrong foot. I always enjoy updates from estates – it adds to the excitement and feeling of a joint venture and nullifies the conveyor-belt atmosphere that some commercial shoots seem to have. Guns like to hear plans for new drives, when the poults are out, any changes to keepering teams and how the season has started. The build up to the day is important for creating healthy anticipation. This is critical for a good event: guns want to see the shoot day in their diaries where it stirs some excitement. And in some cases the anticipation can turn out to be better than the day itself. There is a lot of organisational work needed to make the day happen: hotels booked, estates given all the required information and all the guns fully briefed with location and plans for the day. Good organisation and a healthy anticipation are vital. As a roving syndicate we get the benefit of overnight stays. I don’t think it matters whether this is at a friend’s house, a local pub or a stately home. The principle is the same, gameshooting is a way of spending time with friends and the night before is a key component. It’s impossible to justify the cost of gameshooting purely on the time spent pulling the trigger. This could total less than one hour’s entertainment during the day. The whole trip has to be enjoyable and the night before offers the perfect start. If I look back over my game book, many of the best trips have included a cracking pre-shoot evening. From a country pub with real ale and open fires to a laird’s game shooting lodge: the whole basis of sport is spending time in good company. One of the key aspects for a perfect day is a full team of guns arriving on time. It rightfully drives estates mad when the guns arrive dishevelled and late – we must respect all the hard work that’s gone into the day. The first drive is often heavily debated at the bar the night before. A lot of estates go for the soft opener, wanting a few in the bag and the chance to weigh up the guns and clear the cobwebs from the night before. In principle this is fine as long as the drive isn’t too soft and degenerates into a real bag filler. Guns are realistic and understand they have to see a mixture of drives, but no one drive should ever unbalance the day. The shoot day can be ruined with a heavy and disproportionate first drive; and conversely the day can rarely be made with an amazing first drive as it then sets expectation too high. Estates must try to predict the strength of the team before they arrive and select drives accordingly; likewise guns have to accept it’s not as simple as we all think. A happy medium is important: there is nothing better than a first drive that shows a few cracking birds to whet the appetite along with some that allow guns to get their bleary eyes into gear and make them believe they’re better shots than they actually are. The setting of a drive is very important. An educated gun will not just recognise a good bird, but they will acknowledge a well-presented bird. 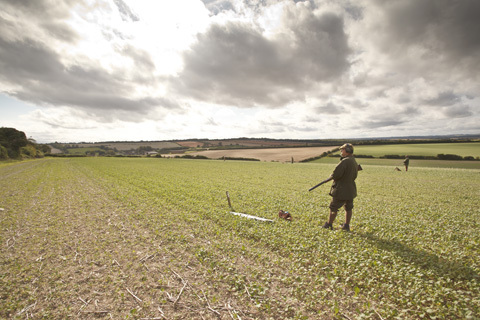 Many guns prefer to shoot a pheasant flushed from a cover crop or woodland and driven out across open countryside – this is a great sporting sight. It allows all guns to see the drive unfold. Watching birds beat the line of guns is what it’s all is about, we have to be challenged and missing is healthy for our sport. An ideal opening drive should be in a picturesque setting, a pretty valley, in view of the main house or amid a wonderful parkland setting. The location should set the precedent for the day – but keep the cream of the sport up the estate’s sleeve. Estates generally respect guns’ wishes and these can take many different forms. Some teams will have drive preferences, which can be a contentious issue, but it does make sense for an estate to try to ascertain the types of drives their clients will enjoy most. I always think it’s sensible for estates to keep records of which drives teams have shot on previous visits. This way they can note preferred drives or vary them if the team come multiple times in a season. The first drive of the day’s gameshooting is crucial – if it’s exceptional then expectations could be set too high. Achieving a happy medium is important. I am often surprised how on some shoots you are given identical drives as the previous visit. I feel a greater level of thought is needed and valued by the guns. There is no doubt that guns have favourite drives, and these aren’t necessarily the high bird drives – often they can relate to a picturesque setting. Trying to facilitate this is pleasant for guns and commercially sensible for estates, all adding to the likelihood of an enjoyable day. There have been many articles about high birds and whether altitude is the most important thing to strive for. I think the key point is that a good sporting bird shouldn’t be judged on height alone. Anyone can flush a pheasant off a valley top. The perfect bird is strong, healthy and flying with intent – not being driven for the third time that week and flopping around or hugging the contours. Meanwhile, away from the gameshooting, if the little things are done well it can have a materially positive impact on the day. Estate owners can’t dictate the amount of rainfall or the wind direction, but they can make sure the guns are spoilt in the catering department. The expectation and excitement of a day only builds if all the guns meet for a wonderful breakfast before the day. An average drive can soon become a lovely one after some lavish elevenses and favourable beverages. The reverse is also true, poor catering and warm white wine will have a negative impact on the guns’ view on the day. The shoot lunch is a drive in itself and it should be a home win for the estate. For the guns it strikes at the heart of what the sport is about – spending time socialising with friends while enjoying fine fare. Other issues that help create a pleasant day are allowing guns the option of when they take lunch, and creating drives where the peg layout is simple and sensible and not some weird concoction with back guns everywhere. Guns rarely enjoy being moved during a drive, they prefer to settle and prepare for the drive on their peg. It amazes me how some shoots get guns to follow the game, who end up feeling like they have been on a wild goose chase. A shoot in the West Country once stopped a drive to move me five yards forward – madness given the point of having a gun is that you don’t need to be touching the bird. For guns with dogs the frustrations of being moved are further exaggerated. There will always be exceptions – such as late in the season – but good and consistent peg layout is important to the day. My perfect day entails some picking-up. I thoroughly enjoy working my Labrador after a drive has finished and it adds a lot of satisfaction to the day. I think it’s a safe assumption that any gun who brings a dog enjoys picking up a few birds and they should be allowed to do so. With a bit of communication, leaving a few birds behind a gun for him to pick with his dog should not be too difficult. The picking-up team should be well back, dealing with the wounded game first and then working in. Picking-up around the peg during the drive can negatively affect guns and should only ever happen if a runner needs collecting. My ideal scenario is being able to turn around after a drive and pick some birds 30-40 yards back, then being able to work alongside the picking-up team as they work towards the line of guns. Clearly in woods the picking-up becomes more of a team effort. The whole process should be amicable with guns and pickers-up allowing each other to work their dogs in the appropriate areas, with respect for each other’s desires and job specification. And ultimately the sporting field and surrounding area should be cleared of all killed and wounded game. Many shoots attempt to offer the guns a grandstand finale, often with the highest birds of the day. This seems a sensible tradition and often something that creates excitement and healthy anticipation over lunch. The perfect day should always end on a superb drive. It sends out all the right signals and means the guns leave with very good memories. The human brain is fickle enough to forget a couple of poor drives if the last one is a belter. I always find it disappointing when guns vanish immediately. The post-shoot tea or drinks is a wonderful chance to debrief on the day and meet key people, such as the gamekeepers who have worked tirelessly all day. On one very sociable shoot where my syndicate take multiple days, the entire shoot team (guns, beaters, pickers-up and shoot captain) often decamps to the local pub for sometimes hours to carry on the day. This embraces some of the key points of game shooting – spending time with friends and enjoying time off from work. It’s probably also worth saying that the perfect day does not include any surprise overages! If going over the bag looks likely this should be touched on before it happens, allowing everyone to know where they stand. My perfect day is a blend of great sport mixed with good company with mutual respect. The less commercial the day feels the better, but it’s a fine balance between everyone being well organised behind the scenes but relaxed out front, helping to create a wonderful sporting day out for all involved.